Assistance and guidance in choosing the right garage door San Jose from well-known industry brands, such as Amarr and Carriage House Door. A competitive price estimate that will include the cost of the entire installation project, from installation to cleanup. Flexible financing options to assist you in paying for your new San Jose garage doors. Superior Products and Professional Installation – This Is the Power of Cal’s Garage Doors! As the premiere garage door installers of the San Jose community, we strive to provide an exceptional shopping experience for our clients when it comes to choosing a new garage door San Jose. What set us apart from competition is that we work closely with our clients to visualize, conceptualize, price, and purchase their San Jose garage doors in one session. We stake our reputation on the fact that you will not be able to find another company that offers our extensive level of assistance. We obtain your garage door measurements. You choose the garage door San Jose that meets your desire for type, design, and color. Select the customized features, like glass and hardware, which you would like for the San Jose garage doors to have. Schedule an appointment for the day of your installation. Select the type of garage door opener you would like to have. We review order details with you. You complete your purchase, and within a few days, your doors will installed by our professional garage door installers. Amarr Garage Doors – Amarr Garage Doors has been in business since 1951. Through the years, they have set the standard, in terms of quality, dependability, and value, for what a garage door San Jose should be. Just like us here at Cal’s Garage Doors, they remain committed to offering garage doors, products, and services that continue to raise those standards even higher. 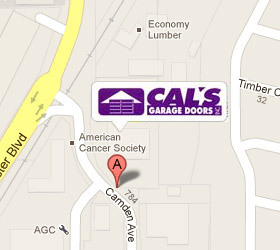 Carriage House Door Company – Cal’s Garage Doors is proud to be a purveyor of these San Jose garage doors. Each Carriage House Door has been meticulously handcrafted, and their doors are characterized by simple, clean lines that complement traditional architecture, from the classic cottage to American country homes to inspiring European styles. Clopay – The manufacturers of Clopay garage doors believe that, since your home’s garage doors can account for over 40% of its curb appeal, they should be just as beautiful as the rest of your home. Our garage door installers possess many years of experience in working with Clopay products, and their doors remain among some of our favorites on the market. Garage doors from Cal’s are a practical and affordable investment for your home. San Jose garage doors can increase the efficiency of your home, as well as increase its curb appeal. Contact us today for a free estimate on your new garage doors. You are going to love how your home looks!